OK, Seriously: What Is Going on With Kanye and These Weirdo Tweets? Kanye West is still on Twitter acting a damn fool, and we really need to have an honest discussion about it. What exactly is going on over there in the “pristine” white sunken place he has built for himself and his big-booty queen? On Wednesday, West took to Twitter to deliver his opinions on everything from Donald Trump to groupthink, showing off his autographed red “Make America Great Again” hat, and posting a picture of himself posed in a group hug with music-industry execs Lyor Cohen and Lucian Grainge—in which Cohen appears to be making the “alt-right” hand gesture as he grins into the camera. He tweeted that he leaves his emojis the “Bart Simpson” color, which Emojipedia then clarifies is the “default skin tone.” Since we all know the “default skin tone” is representative of white people, what exactly is Kanye trying to tell us here? That question was rhetorical. Please don’t feel the need to answer it either in the comments, from the grays or in my Twitter mentions. “For people In my life the idea of Trump is pretty much a 50 50 split but I don’t tell a Hillary supporter not to support Hillary. I love Hillary too,” he said. Yes, we have the right to independent thought, but it’s totally OK to shut up sometimes when those thoughts are a dangerous line of thinking that has been repeatedly shown to get black people killed. Ye’s mileage may vary. Ye then attempted to convince us that he is out of the sunken place, but his tweets say differently, so ... OK? If you are all the way out of the sunken place, why did your wife have to call you and remind you to tell your followers that you don’t necessarily agree with everything Donald Trump does? And after doing that, why did you tweet out a picture of your autographed red “MAGA” hat? Why? 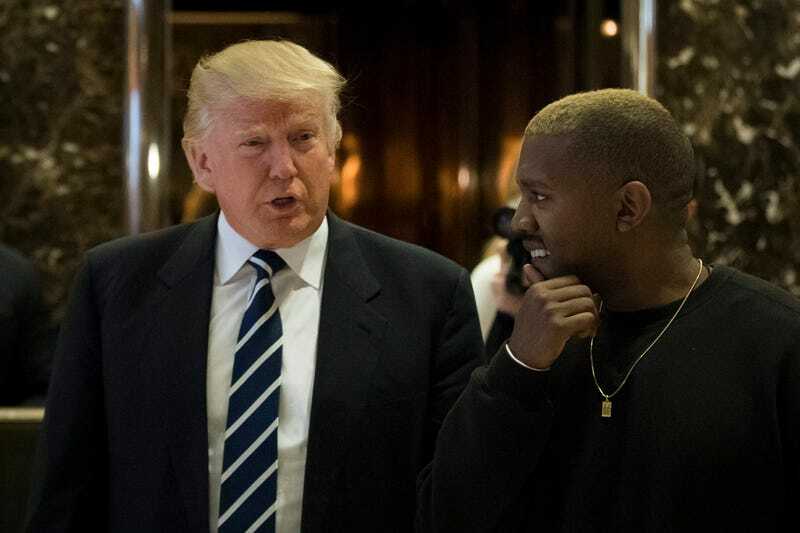 And because our current president is an egomaniacal shithole, of course he had to co-sign Kanye’s tweets about him. Which means his followers will now likely follow Kanye, and we will get a circle jerk repetitive cycle of this lunacy. I have to say that while I was not at all surprised by the nonsense Kanye was tweeting, this tweet by Chance the Rapper—basically co-signing Kanye and his tweets about Trump—caught me off guard. But he was quickly gathered up and corrected. Oh, and let’s talk about how he used Trump’s buzz phrase “fake news” in a tweet referencing his apparel company, Yeezy. As of the writing of this post, Kanye West has 27.9 million followers on Twitter. Every celebrity has their “hive” and their stans. Kanye is no exception. His most devoted stans likely hold on to his every word. It is troublesome that he would tweet favorably about a known racist, classist white supremacist, considering the reach he has. Using the same Orwellian newspeak that Trump uses is irresponsibly dangerous. Words mean things, and when you use your words to further the agenda of someone who “doesn’t care about black people” and is dangerous to the United States as a whole, you become a perpetuation of an insidious problem that is a big part of why the abuse and murder of black bodies has become normalized. Kanye’s reach and influence are important to consider here. If he is propping Trump up as not being a bad guy, what are his followers going to think and believe? Kanye is still in the sunken place, and Jordan Peele agrees.